Pre-Zombie Viper by Dark Horse | The Fighting 1:18th! Today, for your viewing pleasure, is forum member Dark Horse‘s vast imagination at work once more. Ever since they hit retailers and etailers alike, many of us have taken a deeper look at the Zombie Viper, trying to visualize it better within our respective worlds. And there have been some that have gone the extra leap, applying it to Shock Trooper, Viper, and regular Trooper bases. But, what about those poor green suited lads who’ve undergone the process? What might they look like? Dark Horse brought us that answer! 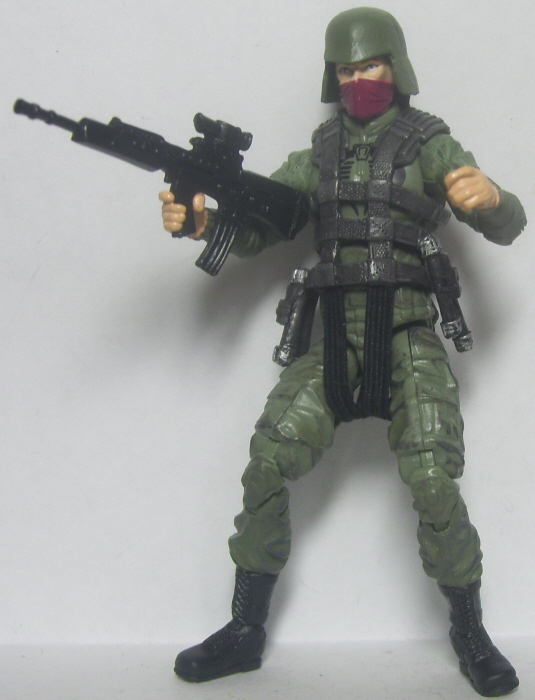 The figure utilizes the Zombie Viper base, Cobra Trooper head and helmet, and 25th Comic Pack Duke’s arms and legs, which have a green hue that resembles the base body almost perfectly. Adding a pair of elastic straps to replace the broken ones on the harness, a dab of paint for a more realistic look, and the Zombie Viper’s hose and canister, and you have one of those poor saps who’ve been selected for the Compound Z experiment! Thanks go out to Dark Horse for sharing one of his creations with us here at the Fighting 1:18th! Click here for more pictures and to join in on the discussion!